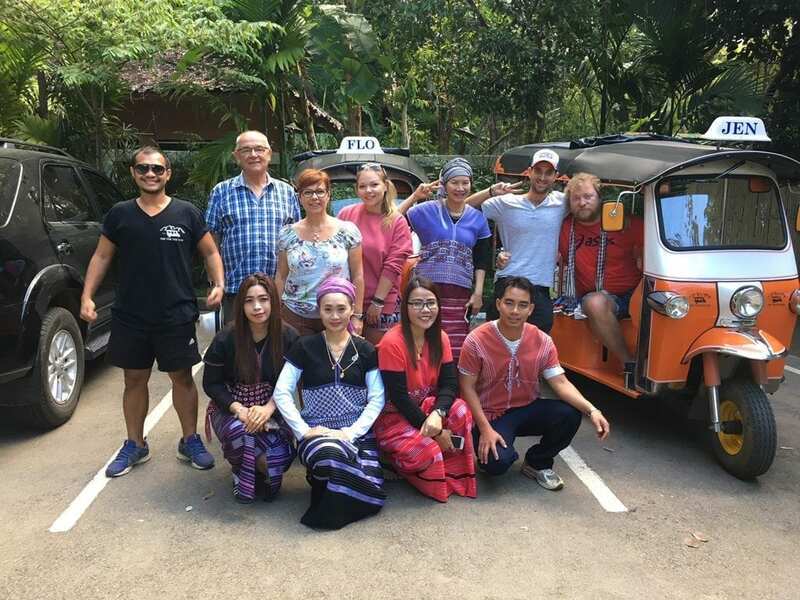 Mark Bibby Jackson spends ten days driving a tuk tuk around the hills of northern Thailand with The Tuk Tuk Club and receives a hospitality he has seldom encountered previously. 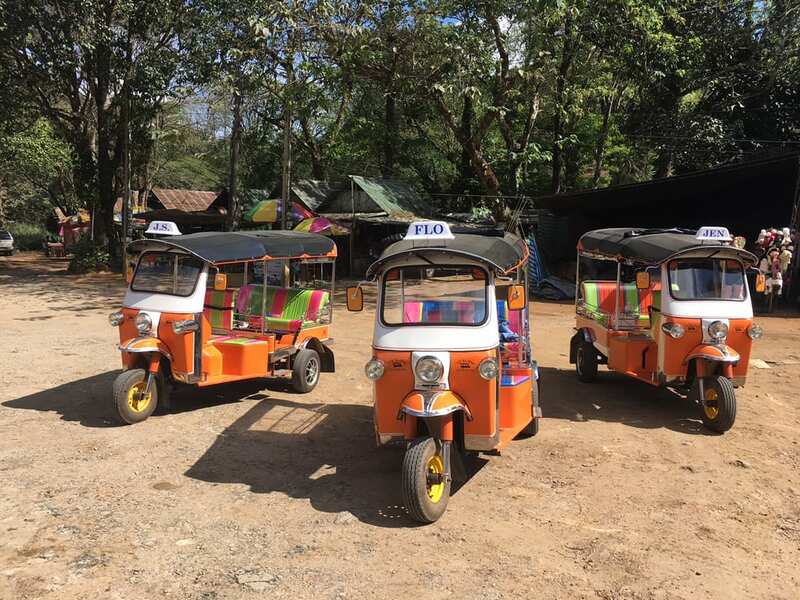 Mark Bibby Jackson spends ten days on his tuk tuk travels around the hills of northern Thailand with The Tuk Tuk Club and receives a hospitality he has seldom encountered previously. A crowd has gathered around Jen. I am used to this by now for she has up-staged me throughout my tuk tuk travels. And I was the one to sleep in Angelina Jolie’s bed – but more of that later. Never act with children and animals, they say. Well, don’t travel with a tuk tuk either. All the staff of the Fern Resort have congregated in the car park, two of them pause by Jen as I get behind the wheel and pretend to drive away with them as my passengers, while the smartphone cameras silently click. Then the rest of the staff line up beside the tuk tuks and more photos are taken. Everyone is smiling. It feels good. If you have not gathered it already, Jen is a tuk tuk, one of the troupe that The Tuk Tuk Club drives around the hills of northern Thailand from their base just outside of Chiang Mai. I don’t know why this memory stands out so clearly in my mind above all the others on our tuk tuk travels. It could have equally have been the time we stopped for lunch at Mae Chaem, only to discover all the restaurant staff standing beside Jen taking photos of themselves next to her. Or equally at the eclectic Ching Ching bar in Mae Sariang, where our guide Smithy struck up a conversation with a group of young Thais who had seen our small convoy – two bright orange tuk tuks and a support 4VD – entering the border town, and explained how they just loved what we were doing. 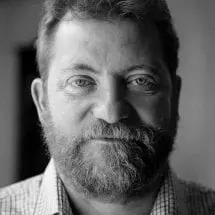 Or the numerous occasions that local Thais smiled at the crazy foreigners driving their tuk tuks up and down – the latter is far scarier – the sweeping mountain roads to Doi Thannon, at 2,565 metres above sea level the highest point in Thailand, and beyond. This is the Thailand they sell in tourism brochures and on videos – the real Land of Smiles. Not the modern-day Thailand you encounter in Bangkok where people sit on the Skytrain, their faces buried in their mobile phones just like their distant cousins do on the London Underground, the New York Subway or Paris Metro, or the false tourist smile of the islands to the south. Our trip started with an hour’s drive from Chiang Mai, where I enjoyed a most relaxing massage the previous evening at the Anantara Chiang Mai – just to get myself in the mood –, to the tiny village of Maewang where our training took place. At first Jen and I don’t exactly hit it off. Quite understandably she takes umbrage at my cumbersome use of the gear with only passing reference to the clutch. And as for the break, the least said of my heavy right foot, the better. Jen gives me the cold shoulder, as she repeatedly judders to a halt on the small basketball court that is our training circuit, in the middle of which a family of Karen farmers are drying some rice. 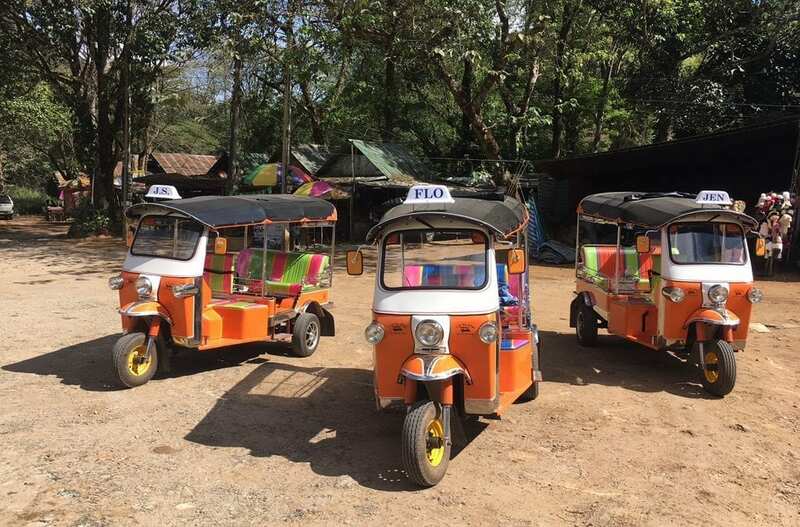 “Maybe, you can try reverse,” Smithy, who is also my driving instructor, suggests, as my badly positioned tuk tuk is clearly in the way of the other learners – a family from Suffolk. With little faith, I turn the ignition again and release the clutch, only for the vehicle to ease its way backwards, slowly. Like Tony Curtis steering the motor boat in Some Like It Hot, I have found my metier – driving a tuk tuk in reverse. After all, nobody is perfect. “Perhaps I can drive backwards on the tour,” I suggest to Smithy. “That would take 30 days,” he says, a broad smile sweeping across his face. He is right, our tuk tuk adventure is only scheduled for ten. After receiving a blessing for the journey ahead at nearby Wat Tham Nam Hoo, we drive the following day to the Maevang Elephant Home. Up to 18 months ago, Maevang was very much like many other places around Chiang Mai providing elephant rides for ill-informed tourists. However, now people come to feed the mammoths and walk beside them to the river where they have their bath – the elephants not the tourists – although everyone ends up in the water. “Here you can feel they are like a friend; you can touch and feed them,” explains Num, who works at Maevang. Seeing him here comes as a bit of a surprise as the previous day he had helped me learn to drive a tuk tuk, after serving us lunch at the hotel. 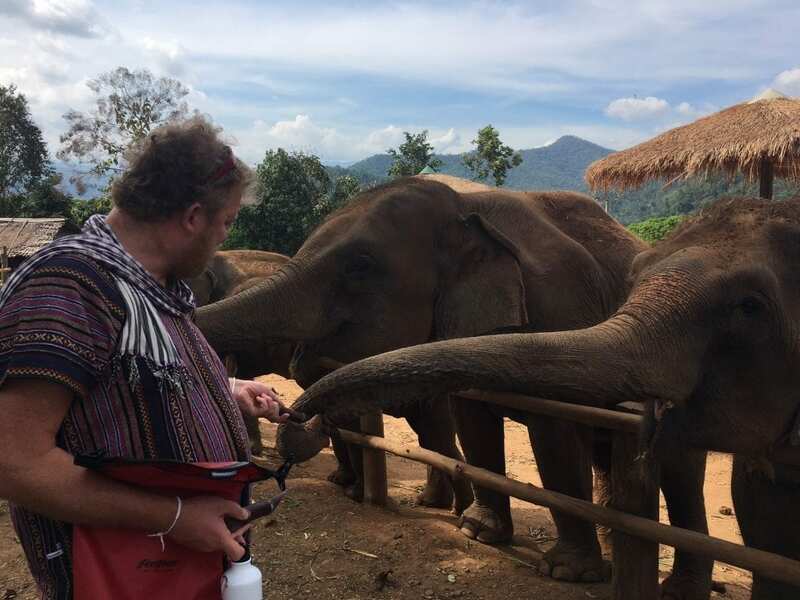 Later he would explain that the V in Maevang – as opposed to MaeWang the name of the river and town – stands for “victory” in their campaign to improve the lives of elephants. Having fed the elephants, who fortunately have a far greater appetite for water melon and sugar cane than for cellphones and selfie sticks, we trundle down to the river. There is a childlike quality to the elephants’ play. One of the smaller ones tries to duck his younger sibling’s head under the water, just like any ‘normal’ child would in a swimming pool; only this time mum stands by imperviously as she shoots a jet of water at us, rather than yelling at her children to behave. Clearly, they are having fun – something that is not often said of their cousins who trudge their way through the forest carrying gap-year travellers or selfie trigger-happy tourists on their backs. Follow Mark’s tuk tuk travels from the start with his Tuk Tuk Diaries. 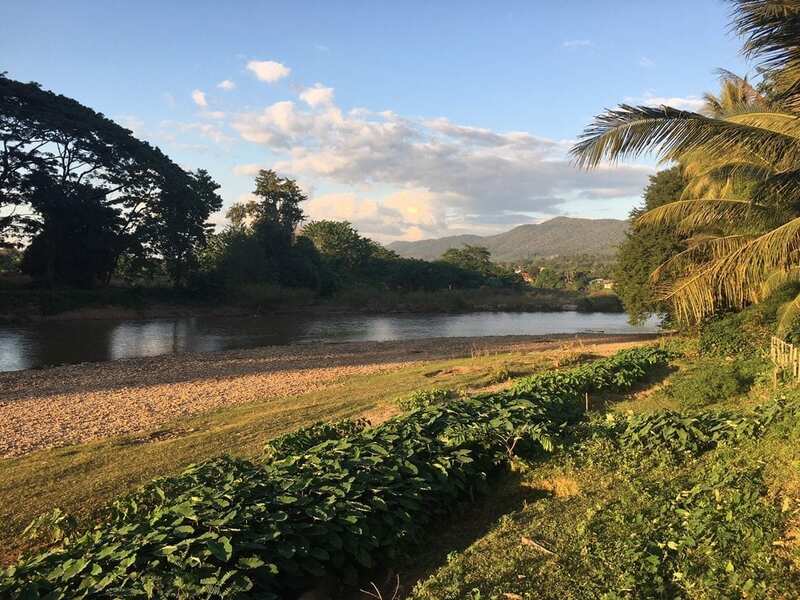 We spend the third night of our tuk tuk travels at Ban Kuhn Klam, where Jen takes a well-earned rest having climbed her way up more than one thousand metres – higher than Ben Nevis – that day. A small community set in the middle of paddy fields, this is the epitome of rural Thailand. 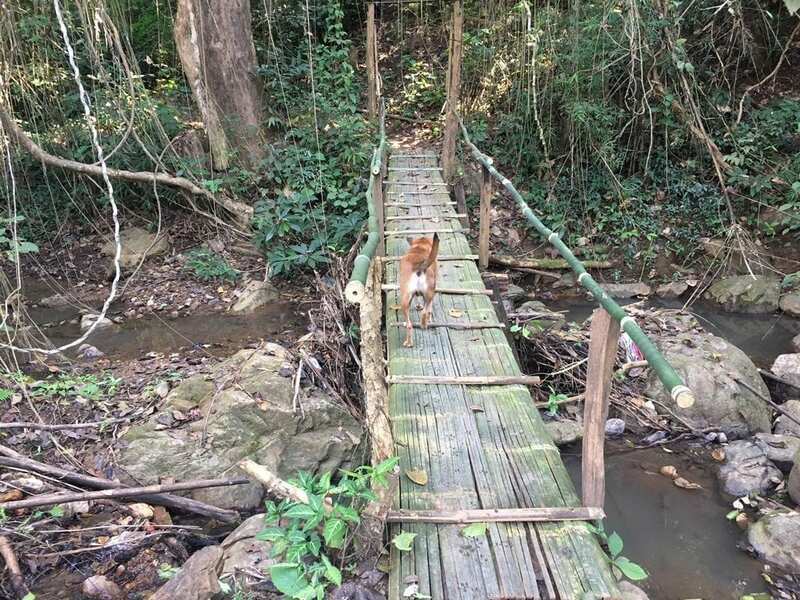 The following day we set off on foot on the Pha Dok Seaw trail in Doi In Thannon national park, following the course of the Mae Klang river. An easy walk, the obligatory guide is more a much-needed income generation scheme for the local Karen people than a life-saving necessity. We pass by an opening where local farmers are growing chrysanthemums rather than the opium of distant travel yarns. At one point, our guide, Lung Dee (“good uncle”), stops to point at a tree. All I can see is a mass of green leaves, but he keeps on pointing. Gradually, one by one all our group can make out what has drawn his attention while all I can see is leaves. A green viper has curled itself around some branches, the leaves providing the perfect camouflage. Fortunately, it’s taking a siesta. Apparently, it has been resting here for the past two weeks having partaken of a particularly substantial meal which it is still digesting, hence its slumber. The following day’s drive is our first long stretch on the road, some 160km to Mae Sariang on the Myanmar border, so Smithy and I share the driving. This is the first day that I truly feel comfortable behind the wheels – instead of dreading the emergence of the next tight bend I find myself enjoying the challenge of sliding through the gears, confident in my new-found acumen. I have discovered my driving rhythm, instinctively sensing when Jen wants to change gear and when to give her a bit of welly. I even discover the art of descending a mountain in third gear without touching the breaks – although Jen does make the most frightful noise whenever I do this. After a night – and too many beers ­– spent in Ching Ching bar, we head to Mae Hong Son some 170 kilometres to the north. On the opening stretch we pass through a lovely boulevard of trees, which provides a delightful dappled shade. Now, relaxed behind the wheel I sense Jen moving towards the 60kph mark – although The Tuk Ruk Club stipulates a 50kph speed limit – and I have to release the throttle, when Smithy gently reprimands me. I even begin to obey the Highway Code Thai-style, indicating left when it’s safe to be overtaken and right when I am approaching a tight bend or an oncoming vehicle – not that the overtaking vehicles take much note of the latter. We don’t quite reach Mae Hong Son, as our destination is some 10 kilometres before the town – the Fern Resort. Angelina Jolie stayed here on a visit in her pre-Brangelina days and then again with Brad Pitt. There is some commotion as we check in. Then the keys are handed out and I am allocated number 16 – Angelina’s room. Now, I am not normally one to suffer celebrities lightly, but as I am led to my accommodation I find myself wondering how extravagant it will be – a four-poster bed perhaps with fine silk drapes – before my guide explains it’s quite “simple”. True enough, I open the door to discover no Aladdin’s den, but a simple wooden bungalow. Still, I think to myself – this is the bed that Angelina slept in. That night, I sleep even better than Jen, who will have the following day off. After a brief visit to Wat Phra That Doi Kong Mu, we spend the rest day searching for some white flowers. At the outset of our tuk tuk travels, the monk at Wat Tham Nam Hoo gave us some candles to burn while we were to make a wish. The only problem was that we each needed nine white flowers in order to perform the ceremony. Smithy had planned to buy some white chrysanthemums from local farmers on the Pha Dok Seaw trek, but the flowers were not yet in bloom. Unfortunately, Mae Hong Son is very much a yellow flower kind of town, as our brief excursion confirms. Eventually, we find some white flowers at the local market, only to discover a white flower shop as soon as we have made our purchase – isn’t it always the way. Despite the inviting prospect of spending our day of rest lazing by the pool, we opt to hike a trail that leads from the back of Fern Resort. Now, the weirdest thing about the walk is our guides. As we assemble at the starting point, the owner of the resort claps his hands several times and four dogs appear before scampering off down a path, while we duly follow. How difficult could the walk be? I ask myself, if dogs are our guides. An hour or so later as we are scrambling up and down some rocks and traversing stepping stones either over or through a stream, I have discovered the answer to my question. In truth, I feel totally at home on the short trek. And I don’t even get my feet wet – at least not accidentally; a small waterfall proving a temptation too far. As I feel the refreshing waters resurrect my soul, I realise this is the reason I fell in love with travelling in the first place. Rachael, the mother of the family from Suffolk, probably wouldn’t agree with me – at least not presently. This is her fiftieth birthday. As she slides her way down the slope we have just climbed, once we realise we are heading in the wrong direction – as our four-pawed guides rummage in the undergrowth – I think she doubts she will ever make it to fifty one. Still, we survive to celebrate her birthday. And as the bottle of champagne that Smithy has carted around with him, is opened, all thoughts of her near-death experience are banished from our minds. Then comes the ceremony. Rachael divvies out the white flowers and the candles, and we decamp to one of the bonfires in the resort’s grounds to light the candles and place the flowers beside them, as one of our errant guides joins us. It is actually quite a moving experience, even to a hardened travel cynic. The following day’s drive to Pai is the most spectacular on our trip with sweeping panoramas of the verdant countryside. We arrive at the Phu Pai Art Resort, a few kilometres outside of Pai, mid-afternoon. Set in some farmland, this really is getting back to nature, and as I relax in the pool I feel that I am an intruder in a foreign land, especially as a farmer strims the now unwanted rice paddy in a neighbouring field. In the evening, we take a minibus to Pai, a town which in truth could be anywhere on the Asian backpack circuit, and for the first time on the trip I feel disappointed, something which winning a few games of pool only partially alleviates. The next day is another one of rest for Jen, which is probably a good idea as the final day’s drive is also the longest. We will travel some 178 kilometres taking the scenic – for that read potholed – route back to Maewang, avoiding the heavy traffic that plies the road to Chiang Mai. The bikers have arrived here first. They all congregate around Jen, needing little encouragement to pose for the camera. I am clearly an optional extra. The clouds start to roll over and there is a genuine possibility that I may have to use the windscreen wiper – there is only one – for the first time. A bunch of bikers pass us on the tight bends. Then we ascend some more before pulling over to the side of the road to enjoy the view at the spot Smithy helpfully describes as “the viewpoint” about half way to our destination. This will be my most biding memory of the trip; the way that Thais have welcomed the crazy foreigners driving their orange tuk tuks around Thailand. I have never felt so true a welcome in all my travels. There is a genuine warmth but also respect for what we are doing, especially as we are taking Jen and her colleague Flo on roads that no self-respecting urban tuk tuk would ever dream of driving. Shortly afterwards Jen starts misbehaving. Smithy thinks we – namely I – have been over-revving the engine as we descended the steep slopes. I suspect that, like myself, Jen has no desire for our adventure to come to an end. He takes over driving, relegating me to a role on the bench for the rest of the trip. The end of the road on our tuk tuk travels – Smithy, Jen and me. What at first feels like a slur on my tuk tuk driving skills – after all I am now a ten-day veteran – soon turns out to be a reward. Sitting in the back I can enjoy our welcome as we pass through some idyllic villages where locals smile or wave at the most unexpected visitors. Eventually, we turn onto the road upon which we started our trek, and I recognise landmarks we passed a week ago. 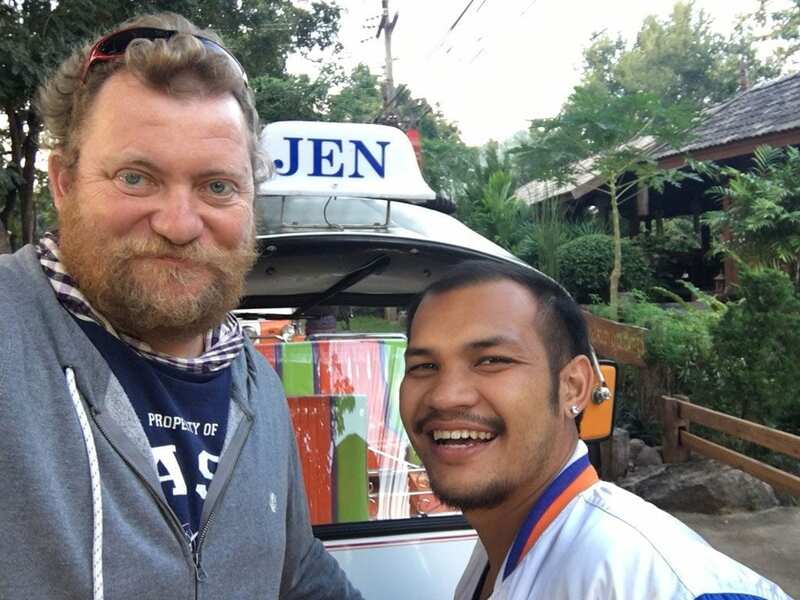 With the chequered flag almost in sight and our tuk tuk travels almost complete, Smithy rediscovers his trust in my driving ability, and he allows me to take Jen home. The hotel where we stayed our first two nights now in clear view, I indicate left and pull Jen into the grass verge by the side of the road, stalling her for one final time as I forget to apply enough clutch and we slam to a halt. At least some things have not changed. The Tuk Tuk Club runs day trips from just outside of Chiang Mai as well as the longer 11-day trip. For more information, visit www.thetuktukclub.com.